Due to our secluded location and intimate size, cancellations affect us significantly. Reservation cancellations made after confirming with a credit card number will result in a 10% administrative fee. If cancellation is made within 8-21 days of arrival, a 50% cancellation fee of the reservation’s total value applies. If your cancellation is made within 7 days of arrival, a 100% cancellation fee of the reservation’s total value applies. Should it be necessary for you to depart earlier than your confirmed dates, you will be responsible for all of the original room nights reserved. Room rates are subject to an 18% resort fee and a 15% Nova Scotia harmonized sales tax (H.S.T.). Room rates and taxes are subject to change without notice. An 18% resort fee for resort & recreational services is added to all invoices which includes welcome drink at check-in, in-room welcome amenity, complimentary one-hour activities (excluding fishing, astrophotography workshops, spa & massage services, culinary and wine appreciation classes), arrival tour at check-in, outdoor wood barrel cedar saunas, riverside wood-fired cedar hot tub, kayaks, canoes, 29r single-speed mountain bicycles, nature trails on our 100-acre property, hiking, lake and river swimming, 3-acre island and footbridge, library, custom handcrafted furniture, daily housekeeping with bathrobes, slippers & l'Occitane amenities, nightly turn-down service, maintenance and set up of in-room fireplaces or wood-burning stoves, complimentary soft drinks, coffee and tea through the day, delicious cakes & pastries at tea-time, wireless internet in public areas, local calls, valet parking. Extra person charges of $65/person will apply if there is occupancy beyond two persons in a room. Trout Point welcomes well-behaved pets (including dogs over 18 months of age) in certain guest suites. Please inquire. Pets must be reserved in advance, be on a leash at all times while in public spaces and are subject to a $25CAD/day fee. Gift Certificates for stays and services are not redeemable for cash, are non-transferable and are valid for two (2) seasons. Gift Certificates for a cash value do not expire. 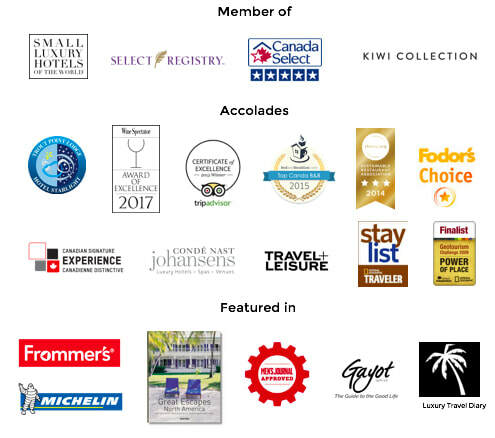 Guests checking in agree to pay all room charges, food & beverages charges, alcohol charges, service charges, resort fee and sales tax using the credit card(s) provided when reserving, checking in, upon check-out and/or departure. The Guest(s) understand that at its option Trout Point Lodge (TPL) may charge balances above $3000.00 before check-out or departure, with the balance due and payable upon check-out or departure. The Guest(s) agree to hold TPL and its agents harmless and to indemnify them for any injury or death caused by engaging in activities while a guest at TPL including but not limited to riding mountain bikes, kayaking, canoeing, hiking, swimming, or engaging in cooking classes. The Guest(s) also understand that TPL may charge his or her credit card after departure for damage to TPL property, for re-setting of fire alarms, and/or for excessive cleaning fees. The Guest(s) understand that TPL is a non-smoking facility and that a $300 cleaning fee will be charged if the Guest(s) smoke in or near a guest room or in public areas. In consideration for privacy protection while at TPL, you agree that there shall be no unauthorized public identification of any guests by name, photograph, or any other means and no public disclosure of any guest by any other guest or third person without prior approval of TPL and/or its other guests in mention. You agree not to publish any reviews, comments and feedback (collectively, the “Comments”) that are offensive, obscene, abusive or objectionable. You also agree that the Comments submitted by you will not violate the right of any third party, including without limitation, copyright, trademark, privacy or other personal or proprietary right(s), and will not cause injury to any person or entity. TPL reserves the right to request for removal and you grant TPL as co-owner of copyright the exclusive right to the immediate removal of publications deemed unauthorized. You grant TroutPoint.com a royalty-free, irrevocable, transferable right and license to your Comments however TroutPoint.com chooses, including without limitation, to copy, modify, delete in its entirety, adapt, publish, translate, create derivative works from and/or sell and/or distribute the Comments and/or incorporate into any form, medium or technology throughout the world. You are and shall remain solely responsible for the Comments you make and you agree to indemnify TroutPoint.com and its affiliates for all claims resulting from any Comments you submit. TroutPoint.com and its affiliates take no responsibility and assume no liability for any Comments submitted by you or any third party.